Crystal Palace drastically increased the pressure on under-fire Arsenal manager Arsene Wenger with a 3-0 demolition under the lights at Selhurst Park. Wenger had previously never lost to Crystal Palace in the league, but goals from Andros Townsend, Yohan Cabaye and Luka Milivojevic sealed a famous victory for the South London club. Arsenal are a team used to dominating the ball for the vast majority of the game, and it was no different on Monday night when they saw 72% of possession, completing 376 more passes than their opponents. The fact that they were on the end of a 3-0 drubbing raises two questions: Why were Arsenal so ineffective despite having so much of the ball, and how did Crystal Palace use their meagre 28% share of possession so efficiently? The emphasis on quick forward passes as soon as possession was won was clear throughout the match. Immediately after the turnover of possession, Palace would look to play direct, either straight to Christian Benteke for him to hold up the ball or into space outside the two centre backs for Wilfried Zaha or Townsend to run into and create 1vs1 situations in which they could utilise their dribbling abilities fully. The co-ordination of the attacking trio in these transitions was excellent, with off-the-ball runs being made to stretch the defensive line whilst maintaining connections between the three of them, ensuring that the player on the ball did not become isolated. One recurring example of how they did this was the ball-far winger coming inside into a central position when the ball was on one side of the pitch. Not only did he offer a closer passing option in doing so, he could also then make himself a central threat in the box should any crossing situations arise. This was often supported by late forward runs from Yohan Cabaye or Jason Puncheon, helping to create overloads around the ball. This was best exemplified by Palace’s second goal, when Benteke, Townsend and Zaha combined together neatly before Cabaye found himself on the end of Zaha’s cutback cross. The late timing of the forward run makes it difficult for defenders to track, as their attention is usually focused on the threats that were already present, in this case the run of Benteke. As Mustafi steps out to close the space available to Townsend, Benteke makes a run into the space in behind. Bellerin, who is already positioned unnecessarily high, fails to tuck around to provide cover. Bellerin and Mustafi now notice the danger of Benteke and desperately sprint towards their own goal to try and get goal-side. Benteke is currently positioned where Bellerin should’ve been anyway. With too much momentum behind him, it is impossible for Mustafi to re-adjust his body and direction to deal with the change in ball direction back towards the edge of the box. As a result, Cabaye has the space to take a shot and score. Set pieces are a well-analysed phase of football, but a less analysed aspect is the set up from goal kicks. Crystal Palace looked to use these situations to their advantage, with Wayne Hennessey to Benteke ending up as the fifth most completed passing combination in the game, and by far Palace’s most frequent link. Whilst it can be understandable if defenders struggle to make the right decisions in defensive transition – it is difficult to think when running back towards goal whilst the ball is moving forward so quickly – it is unacceptable that Arsenal were so incompetent at setting up for goal kicks. With the ball out of play, often for a long time with Palace looking to slow the game down, Arsenal had more than enough time to organise themselves properly. However, Crystal Palace were able to constantly dominate the first and second balls from goal kicks, and thus pick the ball up in an advanced area from which they could build a dangerous attack quickly. Arsenal’s structure would often become disorganised upon the landing of the second ball as players tried to react to the new ball position, thus making it even easier for Palace to break through to create a goalscoring opportunity. There was also a basic lack of aggression and anticipation from the Arsenal players, meaning Palace were able to consistently win 50-50 battles. Palace on the other hand were incredibly organised and had clearly practised the scenario many times in training. With Benteke the natural target of the long kicks, midfielders would position themselves around the Belgian so that a Palace player would be nearby in all directions, thus increasing the probability of the second ball falling to a team mate. Indeed, goal kicks had a huge bearing on the outcome of the match, with Palace’s first goal and also the winning of the penalty that led to the third goal both coming from long balls to Benteke from the goalkeeper. Although Arsenal lost the game due to incompetent defending, the issue of why they failed to score or even create chances despite seeing so much possession must be addressed. In fact, when chasing the game in the second half, the Gunners failed to register a single shot on target. 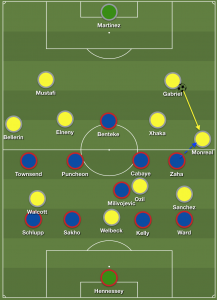 Crystal Palace’s defensive game plan was executed perfectly and the excellent zonal coverage between Cabaye, Milivojevic and Puncheon in the middle played a large part in neutralising Arsenal’s attacking play. The pressing triggers for Cabaye and Puncheon, designed to stop Arsenal progressing the ball forward centrally from Granit Xhaka and Mohamed Elneny, were followed to a tee, forcing Arsenal’s double pivot into sideways and backwards passes, rather than going forward. They normally maintained access to press, especially during key triggers such as backwards passes from the full backs, but also knew when to drop off and protect passing lanes when Ozil tried to create overloads around the ball. Zaha and Townsend were equally impressive in their defensive actions in wide areas, maintaining strong access to their respective full backs so that they could be pressed immediately if a pass was played out wide. This prevented them from playing down the line and going around Palace’s block, instead forcing them to play inside or backwards, setting off the aforementioned trigger for Palace’s midfielders to press and force Arsenal even further backwards. Whilst this pressing did not regain possession of the ball much, Palace crucially were able to stop Arsenal from finding the space to play forwards. As a result, Arsenal had plenty of possession in harmless, deep areas of the pitch, with Palace happy to sit off and protect key spaces nearer to goal. When the situation was not on to press, Palace were able to keep their shape and form a narrow 4-1-4-1 block that sometimes shifted to 4-4-1-1 with Zaha occasionally staying further forward in preparation for the counter attack. Arsenal struggled to penetrate this block, with the Palace defenders adjusting to the ball well and providing nearby cover whenever Arsenal tried to play inside. This meant that they were often able to isolate Arsenal players in wide areas, leaving them with no inside option to pass to in order to continue the attack, and thus they would be forced backwards to the centre backs where they would have to start again. Mesut Ozil, frustrated by the lack of passes into him – Palace’s pressing stopped the central midfielders from finding him and they were also able to isolate Sanchez and Walcott in wide areas to prevent passes inside – often dropped deep to try and get on the ball more. Whilst his presence did help to stop Palace’s press at times – his positioning created a 3vs2 against Cabaye and Puncheon in the middle, meaning it was impossible for Palace to press underloaded – it meant that Arsenal had even fewer passing options further forward. As a result, Arsenal often ended up with sterile U-shaped circulation going around Palace’s block, but never inside towards goal. Arsenal subsequently were unable to create central shooting opportunities that could threaten Palace’s goal. Most of their attempts at creating a chance came from crosses, but the aerial superiority of Mamadou Sakho, as well as the narrow positioning of the back four helping to adequately cover the length of the six-yard box, meant that Arsenal were unable to get a header towards goal. The inclusion of Danny Welbeck, ahead of Olivier Giroud, in the starting XI certainly looks questionable in hindsight, as Frenchman’s abilities in tight areas as well as in the air would surely have come in very useful against Palace’s low block. Arsenal’s incompetence defensively will be a huge worry for Arsene Wenger. Crystal Palace’s three goals came from two goal kicks and a throw in – easily avoidable goals if the team had been organised properly – whilst Arsenal were only able to muster three shots on target all game, despite having the lion’s share of possession. Wenger must quickly address the glaring issues in his team if he is going to continue his incredible record of achieving a top 4 finish in every season he has been at the helm.